I know Christmas seems like a long time ago now but I thought I’d dedicate this Happy List to some of the lovely things I was lucky enough to find under the tree. After all, playing with your presents is one of the few things that gets us through the long, dark tunnel that is January (that and having a snow day). So, here are a few of the things that I’ve been enjoying over the last couple of weeks. Thank you Santa/the mister. 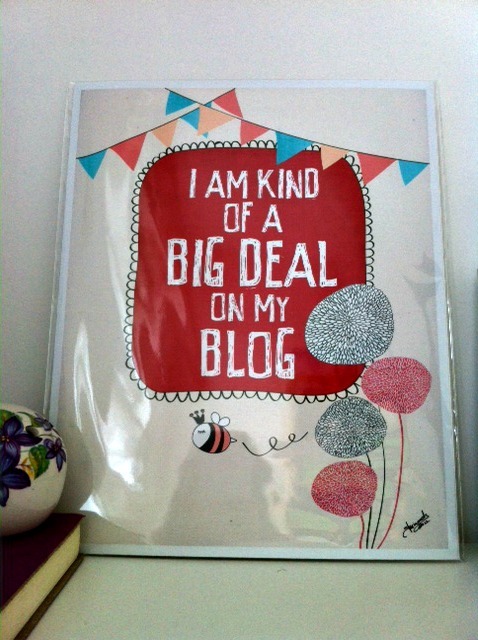 This print by Parada Creations has made me smile ever since I spotted it in a magazine about 18 months ago. I now keep it in the office, along with my tongue firmly in my cheek, as a reminder to chill out whenever I start to take this silly blogging malarky too seriously. 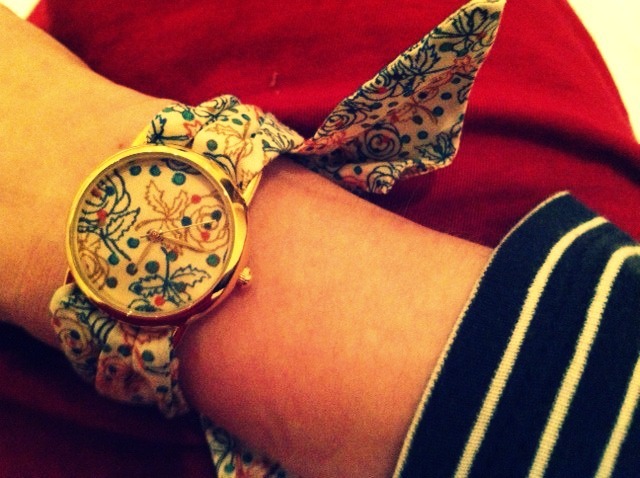 Oh and it has a picture of a bee too so I just had to have it really. On rare days that I’m child-free and don’t need the baby bag and all its gubbins, I’m going to use this Rob Ryan for Alphabet bags tote so that I can feel a bit more like me and not just somebody’s mum. Wonderful, wonderful Washi tape. The sort of stuff you never knew you needed until you had it and bless my mister for popping some in my stocking (even though I don’t think he really understands what it’s for). This was a nice surprise: a rabbit-shaped jelly mould that is a welcome addition to my kitchen dresser. One day I’m going to astound everyone by using it for its actual purpose too. 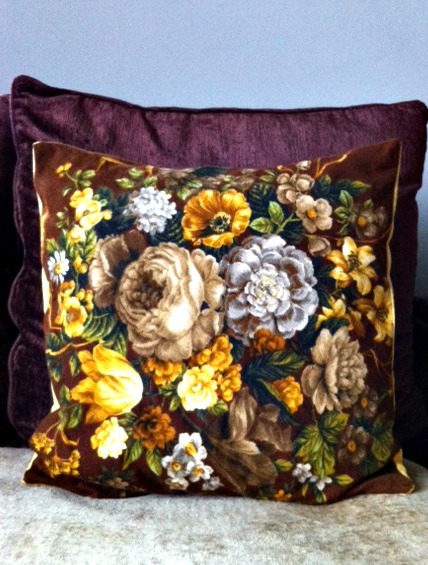 My love of ‘granny chic’ homewares is well-documented on this blog and I just love the colours and print of the vintage fabric that was used to make this one-off cushion from Pretty Dandy. If you haven’t discovered this brilliant online interiors shop yet then I urge you to take a look (even if it is January and you’re skint). Muchos kudos to the mister for buying me this and humouring my taste! Some new music to hum along to. I can heartily recommend both (the one on the left is the latest Bat for Lashes, in case you can’t tell). I’ve also got a place on a sewing course starting in March (at The Sewing Shed, in Ilkley), which I’m really looking forward to and hopefully it will help me to master a few more techniques that I can put to good use in my new venture. More on that front soon! Hope you’ve had a good week and have had chance to play with your new toys recently. P.S. Anyone been toboganning yet? It must be nearly Christmas, I’m already starting to lose track of what day it is slightly. All of this week I’m been thinking (hoping) it’s Friday. Once the kids break up from school I know we can really kick back and let ourselves go. And yes that does mean staying in our ‘jamas until lunchtime if we feel like it. Or going for a lovely walk and seeing Father Christmas like we did today. Here are a few other things that have made my week. Hope you are all nearly ready to ‘down tools’! Watching Florence open her birthday presents. 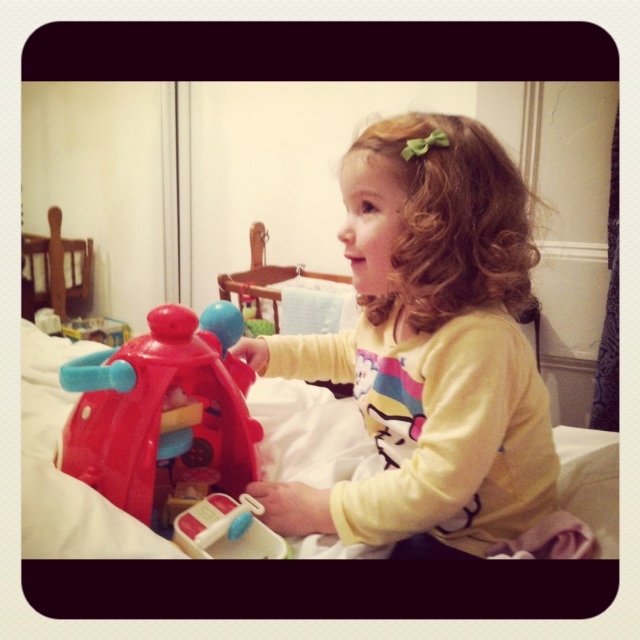 I think I love that red toy teapot nearly as much as she does. I always wanted one of those Big Yellow Teapot toys that everyone else had in the 80s. 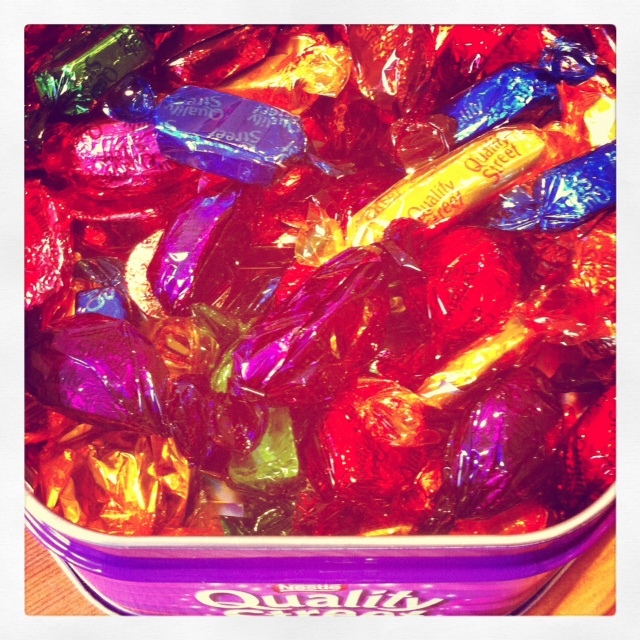 We got our annual tin of Quality Street. It’s officially Christmas now. I love the toffee fingers. Which one’s your favourite? Going to the hairdresser’s and getting my hair ‘done’. It’s always a good excuse to have some time to myself to read a magazine. They also give free hand massages (lovely). 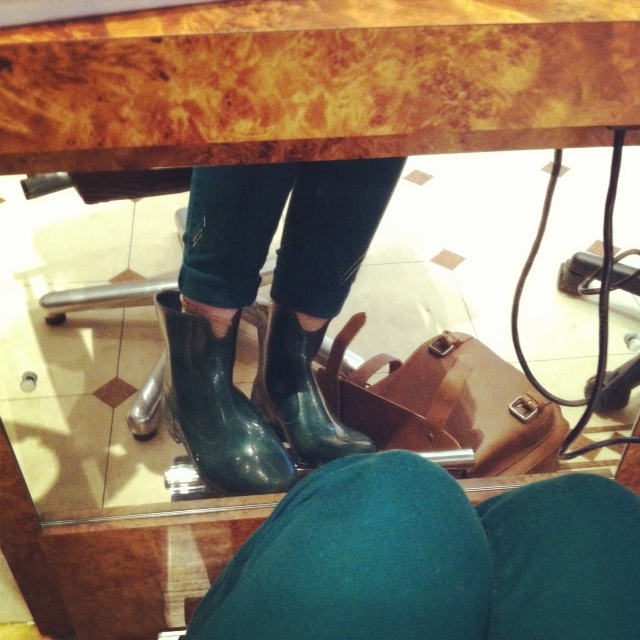 This photo also proves that I do indeed wear my wellybobs EVERYWHERE! 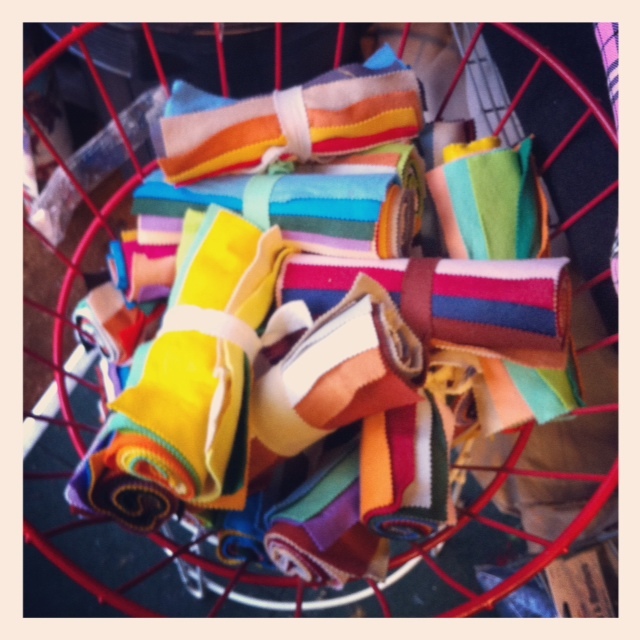 How lovely is this basket of coloured felt? 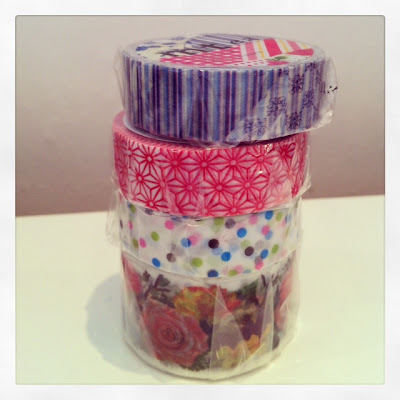 I bought a roll for a craft project I’ve had in mind for a while and am going to tackle over the Christmas holidays. 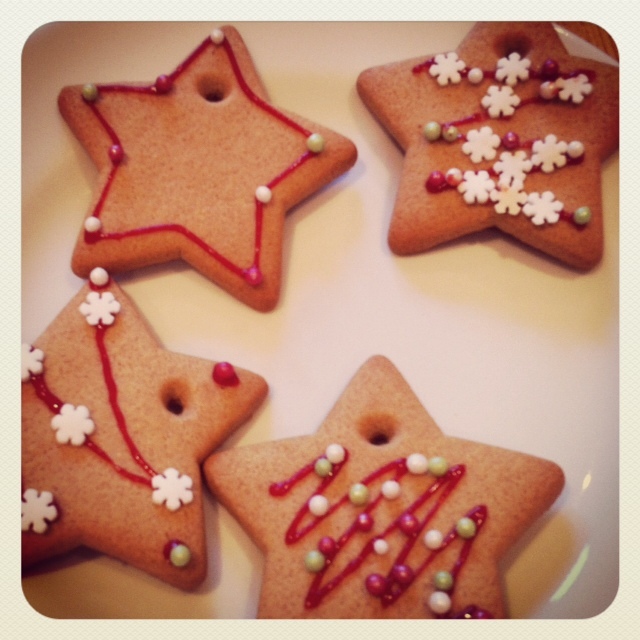 Decorating gingerbread biscuits with the kiddiwinks. Hands up, I didn’t bake these. They were little kits I picked up at Saino’s with the express intention of occupying the kids for five minutes. We took the kids to see Father Christmas. Look at his lounge, isn’t it cute? Mrs Christmas was there too, doing some cross-stitch. Charlie surprised me by saying to Santa: “Please just bring me whatever you’d like to.” I have no idea where that came from but I thought it was really sweet. P.S. I’ve been guest-blogging over at the brilliant Mathilde heart Manech as part of Lisa’s Festive Five week. Myself and a few other bloggers have been sharing what Christmas means to us. If you fancy a read, just click here. Another week has zoomed past (why do they always seem to go twice as fast in the run up to Christmas?). Despite the fact that I seem to have picked up another cold (I think I need to eat more oranges and sleep better), I think we’re *nearly* ready. Decorations are up (as you know), most of the shopping is done and now all I need to do is go see a couple of nativity plays, sing some carols and ding dong (merrily on high) I’ll be feeling the xmas atmos. So, here’s a snapshot of my week and the little things that have put a smile on my face. 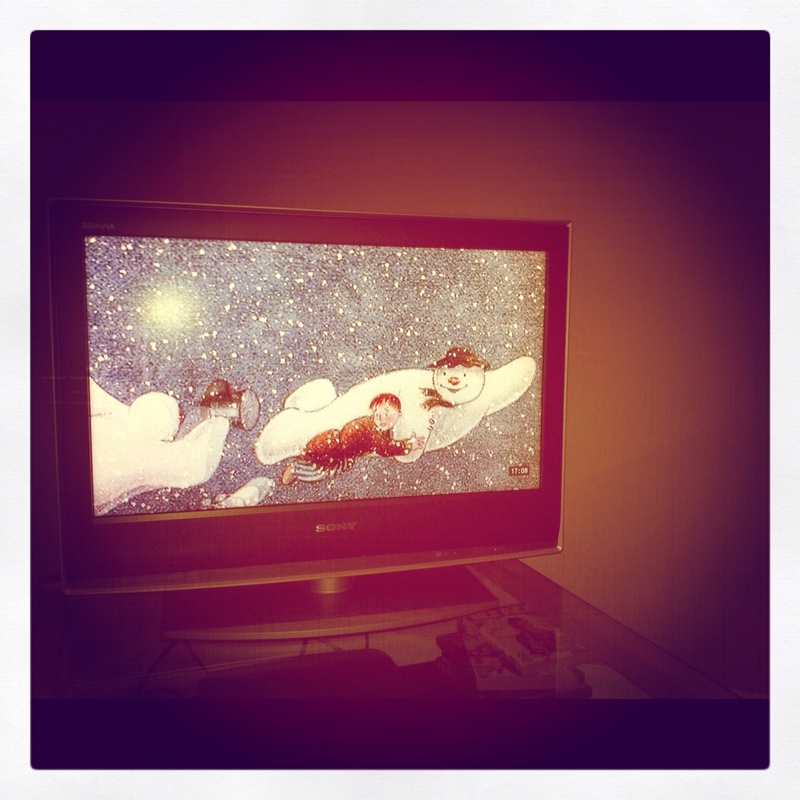 Introducing Florence to the The Snowman for the first time. She is now OBSESSED and wants to watch it on loop. I don’t mind as it’s one of my all time faves too (I have been known to well up when I hear the strains of Walking in the Air). Not so good is the fact she now wants to be able to fly, literally! We also introduced Beatrice to the strange, prickly, green thing in the corner of the room. I think she liked it. 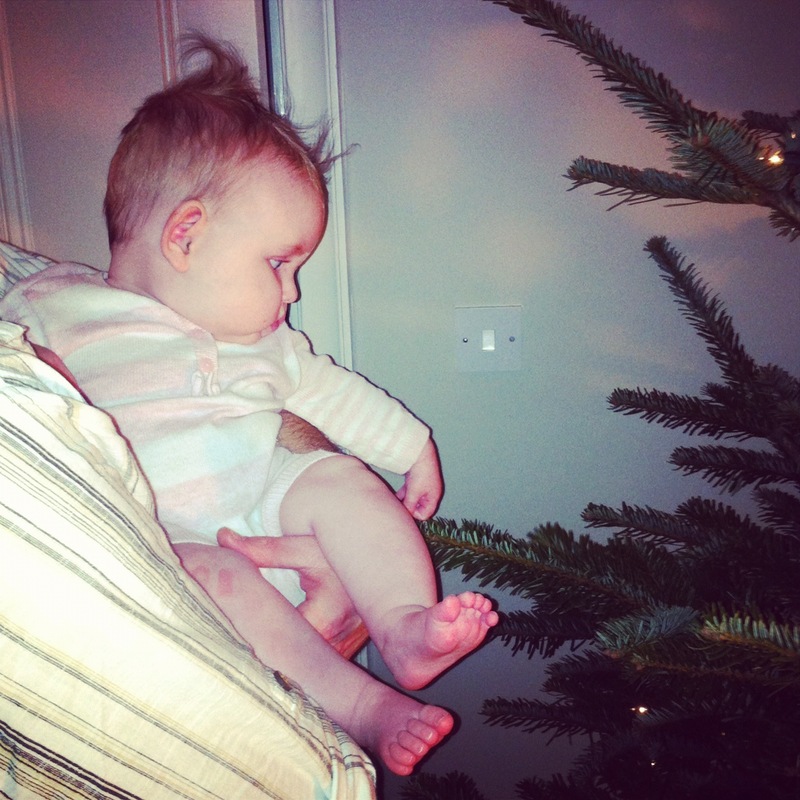 She likes sitting in her little chair and watching all the shiny, sparkles now it’s decorated. 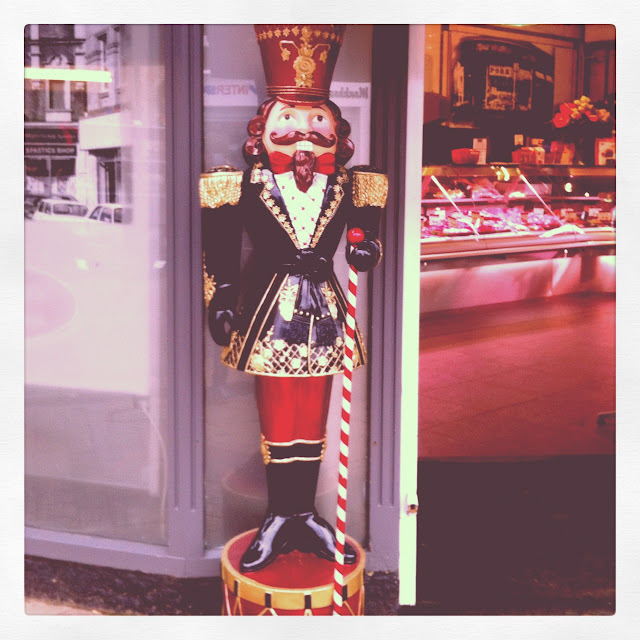 Now you know about my Nutcracker ‘thing’ you can see why I had to snap this rather splendid chap that appears outside the posh butcher’s shop in Harrogate every Christmas. 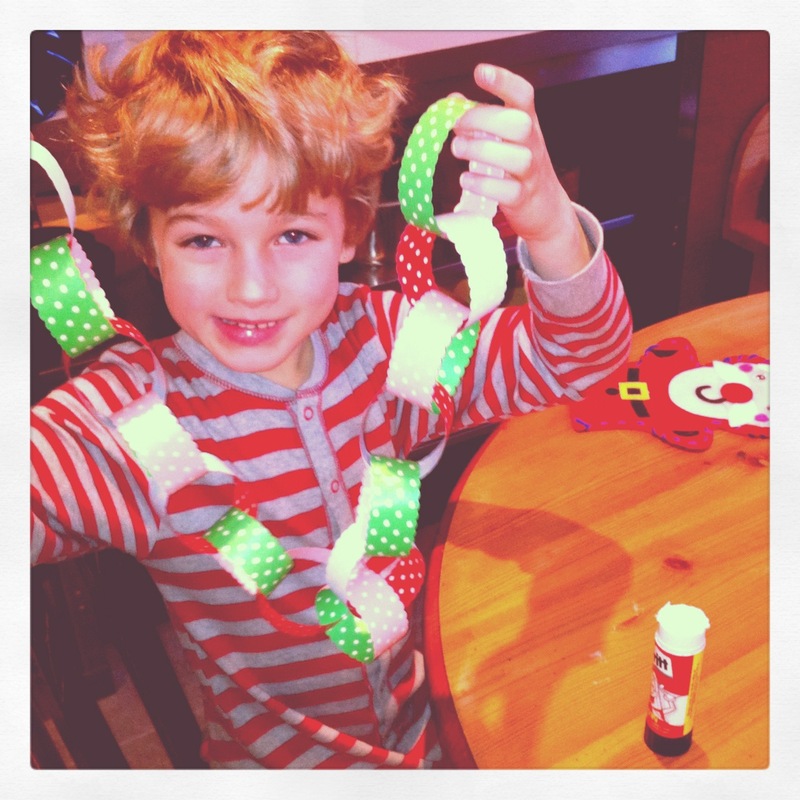 Charlie has been getting his craft on again this week, making yet more paper chains (I’d forgotten I’d bought some in the Cath Kidston sale last January so we have rather a lot now). He’s also been getting busy writing his official list for Santa. 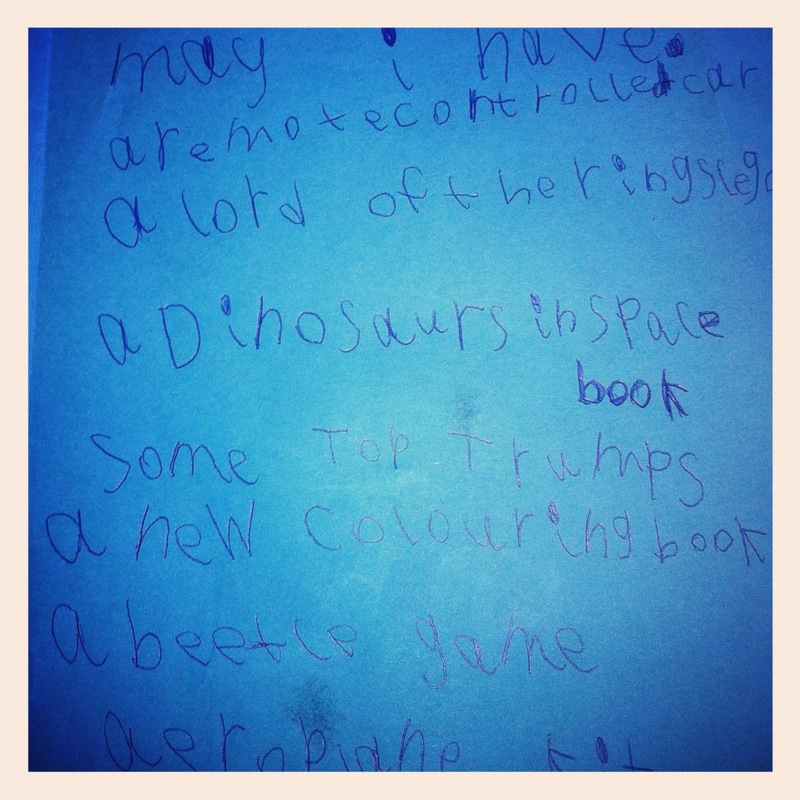 I’m secretly quite chuffed that he wants Lord of the Rings Lego as I think it’s pretty cool myself. Have you seen it? The hobbits have shaggy perms and everything (hilarious). 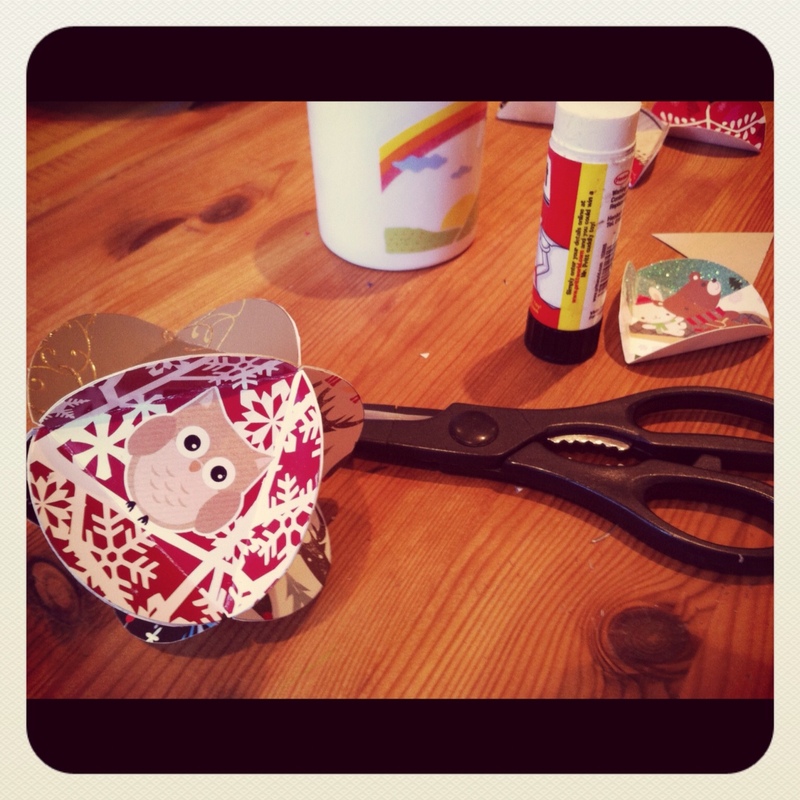 A bit more Christmas crafting, making baubles out of last year’s cards. Please see previous how to here! Finally, me and the mister went to do a bit of Christmas shopping and treated ourselves to a glass of mulled wine and a mince pie in Betty’s. We took the baby too and she was really good; sitting up and taking it all in. I think she was suitably impressed by her surroundings. Clearly she appreciates a good tea room, just like her mummy. That’s my girl! How was your week? Are you getting there? This week seems to have zoomed past and we are hurtling towards Christmas rather quickly. 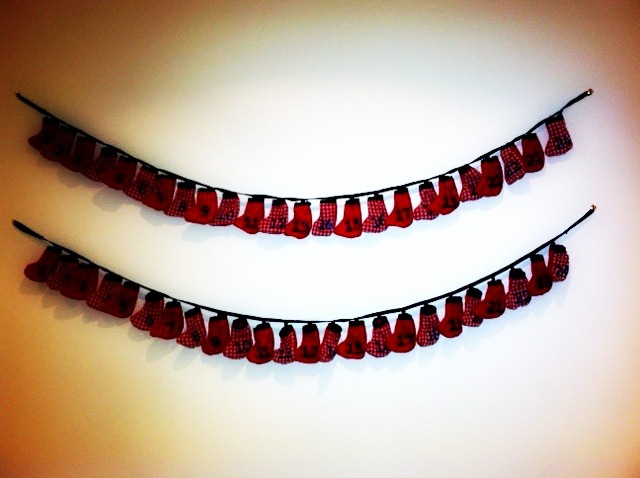 I have to admit to being quite jealous of all the people I know (online and in ‘real life’) who have already put up their decorations. But we are getting our tree tomorrow and I’m quite giddy at the thought. In the meantime, these advent calendars have caused much joy and excitement (there are chocolates inside each of those little stockings) every morning this week. 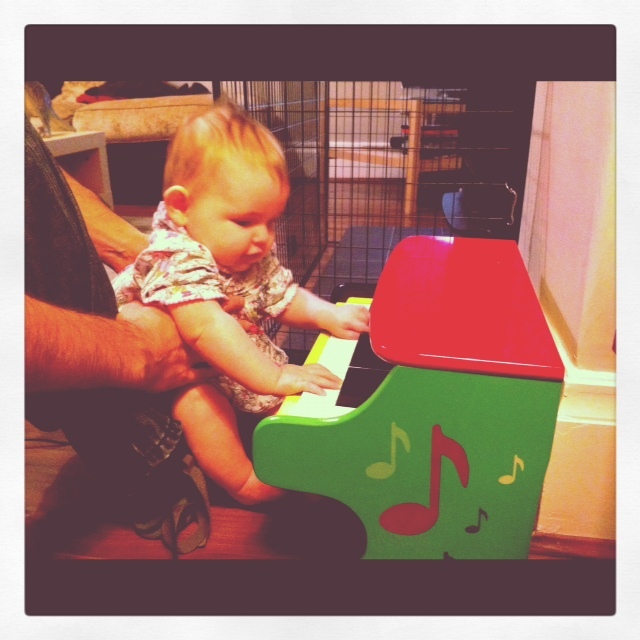 Beatrice has discovered a love of the piano. It’s her new favourite thing. I love the look of intense concentration on her face and the delight when she makes some noise/music She’s growing up far too quickly (sigh). During one rare moment kicking back on the sofa this week, I noticed the most beautiful and fleeting winter sunshine as it shone through our lounge window. 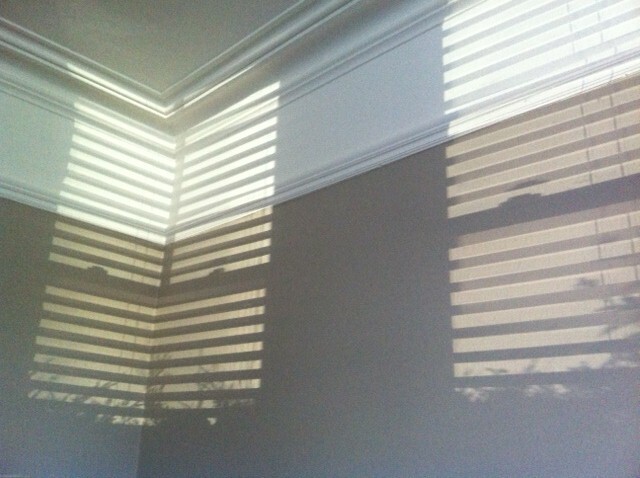 The wind was blowing the little plants in our window boxes and making their shadows dance on my wall. I’m glad I snapped it before it disappeared only too quickly. 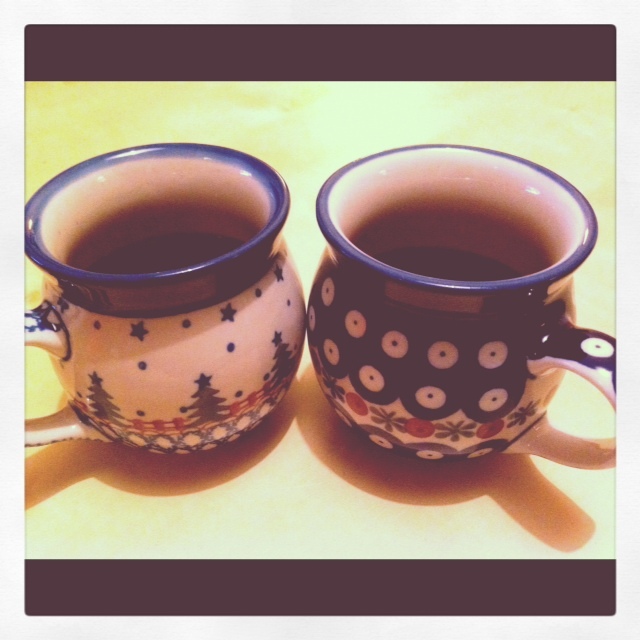 This week I had my first mulled wine (of the season) and it tasted extra nice out of my new Polish pottery mugs, which I picked up at the Country Living Show last weekend. Florence will be three years old on the 16th Dec (no, we didn’t plan that one very well). This is the first year that she seems really aware that it’s her birthday and she wants to have a proper party. 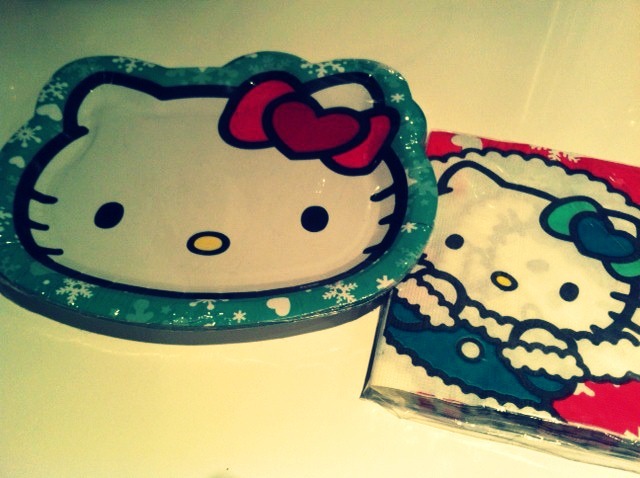 I found these Christmassy Hello Kitty party plates this week and now she’s even more excited. P.S. I’m guest blogging over at the brilliant Rosalilium blog today as part of Christmas Cheer Week there and I’m making an easy Christmas pud. Come and have a look and a catch up on all the festive fun. Click, clickety click here and zooom you’re there! It’s been a nice but slightly knackering week for me. Our whistle stop tour of friends in London over the weekend was great but the five of us didn’t get home until 10pm on Sunday night and I’m the sort of girl who likes to be in my ‘jamas way before that. But it was great to see old and new friends (and wonder not for the first time how we all ended up as grown-ups with kids). Here are a few other things that have made me happy this week. While down in London, we managed to squeeze in a trip to the zoo. It was a bit of a rainy day so we took refuge in the undercover Sea Life section. My kids go mad for sea creatures. Truth be told, so do I. How can you not be mesmerised by something as amazing and otherworldly as a seahorse, jellyfish or starfish (or “sea star”) ? 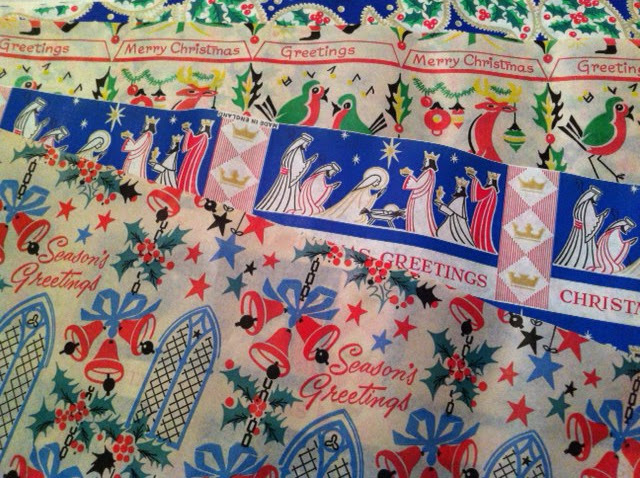 I found these sheets of original vintage Christmas wrapping paper at a craft fair recently. Apparently the stall owner’s dad had kept it for years in the attic, in perfect condition. Only problem is, I’m not sure I have the heart to use it. Anyone got any ideas what else I could do with it to preserve it? 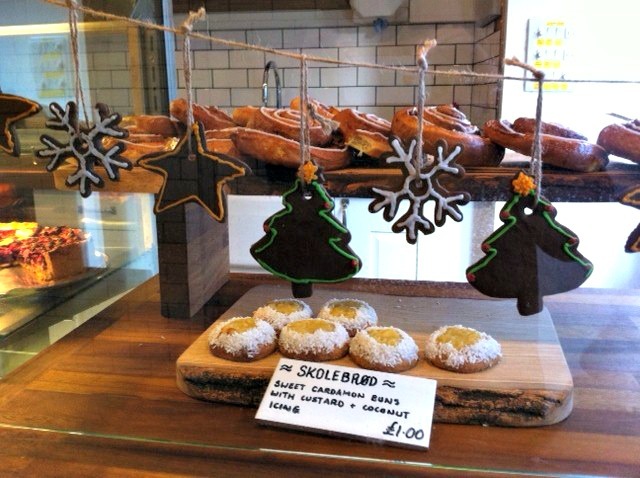 Gingerbread Christmas decorations. Too nice to eat (almost). 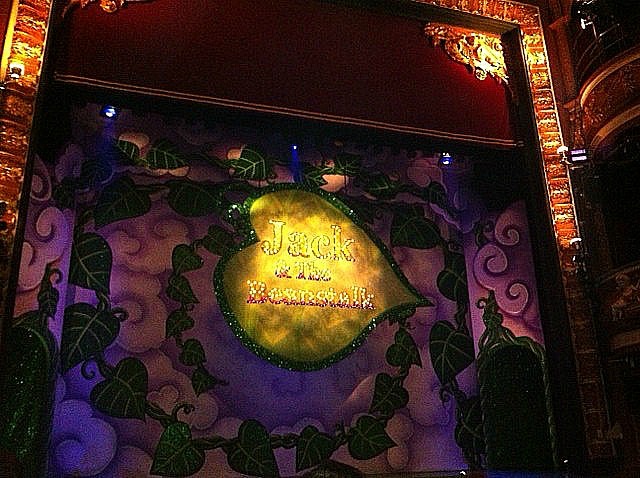 Going to the pantomime. Now I know I’m really on countdown to Christmas. A bit of booing and hissing at baddies always makes me feel better too. Taking my little man for a treat. It’s not very often that I get to spend one-on-one time with Charlie these days. He’s growing up sooo quickly now. But it’s lovely when you realise that your six year old has grown into a great cafe buddy. The Country Living Christmas Fair has come to Harrogate for the first time this year. I’m off to have a look around today. I think I might finally get my Christmas shopping kicked off and I’m looking forward to seeing some familiar designer-makers I know. Hello lovely things, goodbye savings. P.S. Stand by for a week of Christmas giveaways starting here on the blog on Monday!! !